This volume is based on a conference held to examine what is known about cognitive behaviors and brain structure and function in three syndromes and to evaluate the usefulness of such models. The goal of this endeavor is to add to the knowledge base of cognitive neuroscience within a developmental framework. Most of what is known about the neurological basis of cognitive function in humans has been learned from studies of central nervous system trauma or disease in adults. Certain neurodevelopmental disorders affect the central nervous system in unique ways by producing specific as opposed to generalized cognitive deficit. Studies of these disorders using neurobiological and behavioral techniques can yield new insights into the localization of cognitive function and the developmental course of atypical cognitive profiles. The focus of this book is a discussion of the multidisciplinary research findings from studies of autism, and Williams and Turner syndromes. The approaches, methods, techniques, and findings reported are at the cutting edge of neuroscience research on complex behavior patterns and their neural substrates. Each disorder is accompanied by some degree of general cognitive impairment or mental retardation. Of greater interest are the atypical deficits in which a cognitive function is spared, such as language in Williams syndrome, or is disproportionately depressed as are spatial discrimination skills and visual-motor coordination in Turner syndrome. Drastically reduced or seemingly absent language capabilities and little interaction with other people characterize the core autism syndrome. A comprehensive and critical discussion of appropriate statistical techniques is made vivid by examples given from studies of small groups or single subjects in neurolinguistics and related fields. "This book has been a pleasure to read and review. Such consistently high-level essays are rare in edited books, but in this case it is understandable given the participants of the workshop. I found myself informed as a clinician and researcher, not only in terms of content but more importantly in terms of methodology..."
"...this monograph provides incisive, insightful, broad but focused epistemologic discussions of issues that investigators of children's cognition, language, social ability, and other behaviors, and their relation to underlying brain maturation, ignore at their own peril. 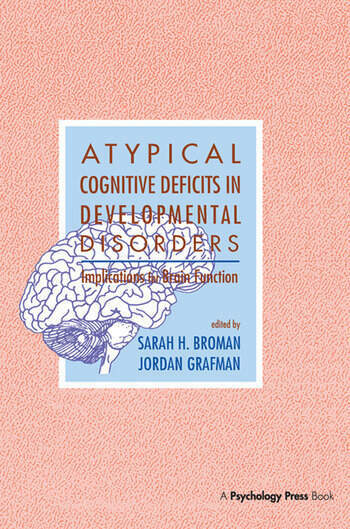 Held at the start of the Decade of the Brain, the conference on Atypical Cognitive Deficits in Developmental Disorders: Implications for Brain Function aptly sets the scene for the Decade by laying out the requirements for conceptually, methodologically, and technologically sound multidisciplinary research in this area. It provides investigators with thoughtful and rich essays they will want to ponder, return to, and discuss throughout the Decade of the Brain."